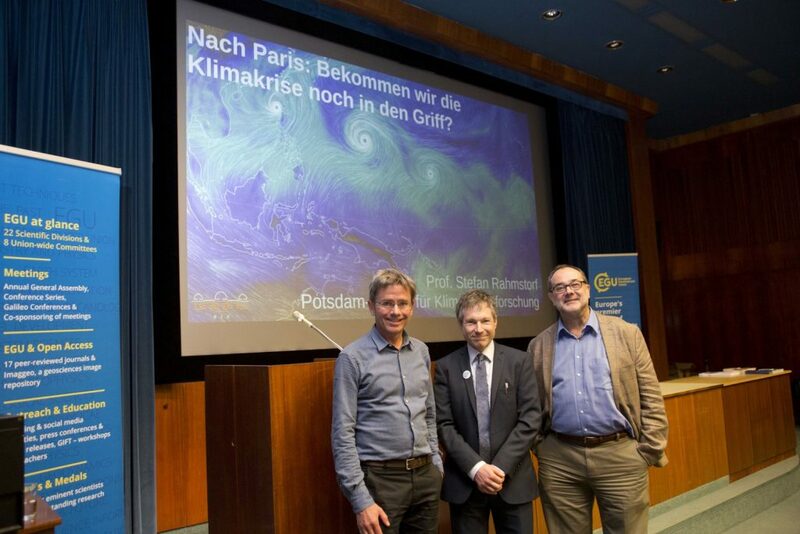 The inaugural EGU Public Lecture, titled ‘After Paris: Are we getting the climate crisis under control?’, took place last April at the 2018 General Assembly in the Natural History Museum of Vienna. In this first public lecture, Stefan Rahmstorf, a climate scientist at the Potsdam Institute for Climate Impact Research in Germany, took the audience on a fascinating journey through the climate system, discussed its impact around the world, and addressed whether the Paris Agreement will mitigate the risks of Earth’s changing climate. Claudia Volosciuk from the World Meteorological Organization reports on the lecture. 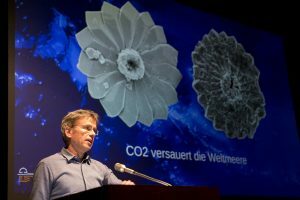 Rahmstorf started by taking a look at the small and fragile planet Earth from space, explaining the ways in which Earth receives and radiates energy, including an animation showing the history of greenhouse gas emissions. He then went into more detail, showing for example the sources and sinks of carbon dioxide and how its increase in the atmosphere is human-caused. The lecture covered multiple geoscientific disciplines and highlighted their connections to each other: from coral reefs to the cryosphere, the oceans to the atmosphere, and hurricanes to deserts. The audience also gained insight into the various methods that geoscientists use to study different aspects and time scales of the Earth system. For example, scientists estimate potential future climate outcomes, by employing climate models to analyse the Earth system’s response to different greenhouse gases emission rates, also known as climate scenarios. To reconstruct Earth’s past climate, researchers have used natural archives (like ice cores or tree rings), and written records. These observations and reconstructions reveal that the hottest summer in Europe since 1500 took place in 2010, followed by 2003, 2002, 2006 and 2007. “I believe that you don’t need to ask a statistician if you want to know whether this is just chance, it’s clear that this is a systematic effect,”* emphasised Rahmstorf. Referring to the presentation’s title, Rahmstorf highlighted the great success of ratifying the Paris climate accord to limit global temperature rise to well below two degrees above pre-industrial levels, but he argued that it came 20 years too late. If the agreement had been reached earlier, there would have been more time for countries to curb carbon emission rates and transition to a carbon-free economy, explained Rahmstorf. He also cautioned that the agreement isn’t a perfect solution as it still implies a substantial warming. For instance, if we met the Paris agreement’s global temperature rise goal, Rahmstorf noted that the average temperature over land would be higher than the global average, as the oceans do not warm as strongly as land masses. Reaching the Paris agreement goals would still create conditions beyond what Earth has experienced for hundreds of thousands of years. Rahmstorf suggested mechanisms that policy makers could adopt to increase the speed of emission reduction, which is not yet sufficient to reach the Paris agreement goals. These include establishing a minimum price to emit carbon dioxide and ending subsidies for fossil fuels, which are currently still higher than renewable energy subsidies. 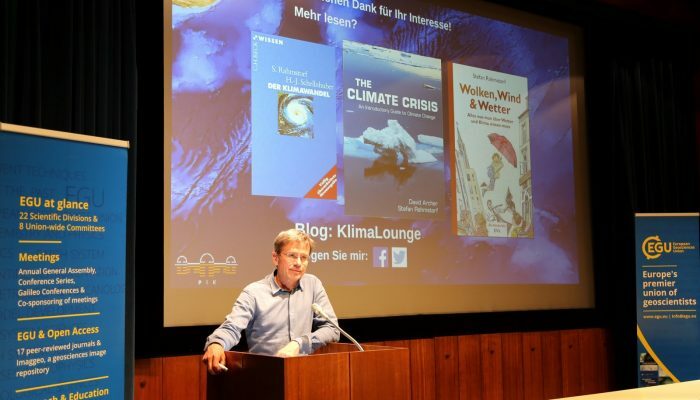 The director general of the Natural History Museum of Vienna, Christian Koeberl, highly appreciated the Union’s decision to conduct the public lecture at the museum, as the institution has a variety of geoscientific activities, including preserving collections and carrying out research projects. “Today’s topic is one that interests and affects us all, namely climate. Climate is obviously something that is strongly connected with our understanding of the Earth, but also with our interaction as humans with the Earth,”* Koeberl remarked. The event was at full capacity, attended by an audience spanning all age groups, suggesting that Koeberl’s sentiment was widely shared.